The man behind one of Britain's best-loved cartoon strips, The Perishers, has died. Maurice Dodd, who began writing the strip in the late 1950s, died on Saturday evening, aged 83. His son Mike said he had collapsed at home with a brain haemorrhage and died later in hospital in Ashford, Surrey. The cartoon, which appeared in the Daily Mirror, tells the story of a group of children and a hairy Old English Sheep Dog called Boot. 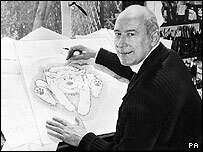 Dodd began writing the strip when its inventor, Bill Herbert, the cartoon editor of the Daily Mirror, asked him to revive its fortunes. He worked alongside artist Dennis Collins and produced rough layouts containing ideas and a script. The partnership lasted until Collins retired in 1983. Dodd's son Mike, 53, said his father took inspiration for the strip from listening to the chatter of his own four children. "There is a lot of us in those characters," Mr Dodd said. "And there is a lot of my father in Wellington. He took various aspects of us although none of us is actually Marlon the complete idiot. "My Dad got an awful lot of ideas about kids from listening to his own children talk and watching the world go by." Dodd produced the strip while working for an advertising agency, where he wrote the nationwide Clunk-Click safety belt campaign in the early 1970s fronted by Jimmy Savile. But he gave that up in 1980 to concentrate fully on making the cartoon into an animated TV series, and to write children's books. He was still writing storylines for the strip beyond his retirement and up to his death. Dodd was born in Hackney, east London, in 1922. He leaves his wife of 60 years, Daphne, and four children.